The Cottage Nursery Glider, one of the most popular Little Castle Chairs, is also available in a Recliner! The Cottage Recliner by Little Castle is a full sized chair, 36″W x 35″D x 40″H, featuring a 360 degree swivel, a smooth glide, and a full recline! If you’ve sucessfully rocked your sweet baby to sleep, stretch out and join her with one smooth reclining motion. The recliner handle is deftly hidden on the interior of the chair, giving this recliner a sleek, streamlined look. The reclining footrest easily pushes down with pressure from your legs. For even more versatility, add an ottoman to your recliner chair to put your feet up without reclining. The Cottage Recliner has an attached pillow back, traditional arms, and a reversible loose cushion. The Cottage Nursery Glider Recliner can be custom covered in any one or any combination of Little Castle fabrics, with over 120 options to choose from! It can also be custom covered in any upholstery grade fabric of your own choosing, using 8 yards of solid fabric or 10 yards of printed fabric. A little castle recliner has a tailored bottom edge with no skirt or trim. Available customization options include piping – an additional 1 yard of custom fabric, arm covers – 2 yards of fabric, or a variety of pillows – one yard of fabric each. A glider recliner can be used in a living room or family room, or even your own bedroom, once your child is done nursing! Consider using fabrics that match your home decor to get the most versatility out of your new Little Castle chair! The cozy Cottage Nursery Glider Recliner by Little Castle is a chair you will admire and use for years. Little Castle chairs usually ship in 6-8 weeks, so order your Little Castle Glider today! Royal Bambino Introduces Westwood Baby Nursery Furniture! Royal Bambino is pleased to announce that it is carrying NEW baby furniture from Westwood Design Baby Nursery Furniture! Eight beautiful collections of this stylish and affordable baby nursery furniture are now available at Royal Bambino! Visit Royal Bambino’s retail location now to view floor models from Westwood Baby Nursery Furniture! Westwood Baby Nursery Furniture is a company that creates quality baby furniture for the nursery and beyond. Westwood Baby Furniture is thoughtfully designed with rich finishes, surface embellishments, and unique and attractive styles that you won’t find in any other nursery furniture company. Westwood Furniture has the safety of your baby in mind in all of their nursery furniture with anti-tip safety straps on all chests, hutches and armoires, extensively tested finishes that surpass general safety standards for baby furniture, random convertible baby crib safety testing by an independent company, and baby nursery furniture that is CPSC and JPMA certified. Westwood Baby Furniture also focuses on convenience with their trademarked Easy Reach drawers on combos and changing tables – drawers that swing out at an angle, allowing you to keep all of your changing supplies within your grasp without having to back away from your baby – as well as offering Touch Lights fitted into their hutches – lights that turn on with a single touch to a small hidden pad, to facilitate changing your baby at night! With quality construction features on all of their convertible baby cribs like solid wood corner posts and top rails so that parts don’t give under pressure, case pieces featuring fully solid wood drawers with English Dovetail joints, center supports, reinforcing corner blocks, and smooth ball-bearing drawer glides, and permanently glued steel inserts for all removable parts, your Westwood Baby Nursery Furniture is built to last! Royal Bambino has updated our selection of Bratt Decor sophisticated and elegant baby furniture. The newest addition to the Bratt Decor line is the Manhattan Collection, a rich lyrical collection offering two classic cribs. The Soho Crib provides an updated modern style with flat headboards and optional loft kit for added luxury. 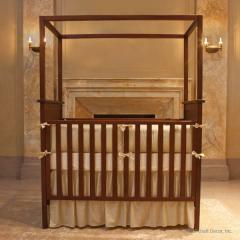 The Park Avenue Crib has gentle arches for a soft, timeless look. Both cribs are convertible to toddler beds to give added life to your baby crib! The Manhattan case pieces feature clean lines which enhance the simple sophistication of the collection. Matching pieces to the Manhattan Collection include a dresser/changer, double dresser, armoire, bookcase, and mirror, all boasting the same crisp edges that makes the Manhattan Collection so appealing! Bratt Decor’s Blu Collection is also a recent entry, a contemporary line featuring a modern style crib and case pieces. The Blu Panel Crib features flat slats and four sides of equal height, with two solid side panels and optional micro-suede panel covers with matching bumpers offered in several contemporary colors for a splash of whimsy. Matching case pieces include a dresser/changer and a mod storage cubbie featuring drawers and shelving for versatile storage options. Bratt Decor’s staple collections are available as well, including heirloom iron cribs in gold and pewter and the Chelsea Collection available in antique silver and other finishes, which features Bratt Decor’s only Lifetime Crib! The Chelsea Lifetime Crib converts to a full sized bed once your baby has outgrown his crib! Also available from the Chelsea Collection are a cradle, night stand, dresser, and bookcase which coordinate beautifully with the heirloom iron pieces. 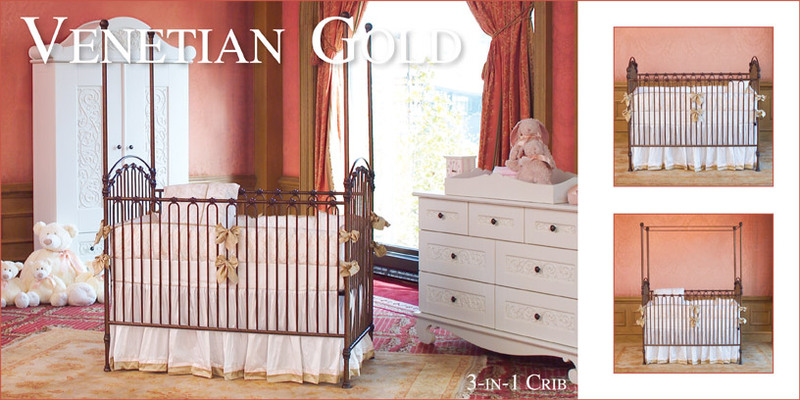 Furnish your newborn’s nursery with quiet opulence. Bratt Decor’s intricate carvings and ornate details combine to create a dream nursery every mother can appreciate! Royal Bambino’s retail location now has the popular Savannah Collection in onyx finish by Munire Furniture on display on the showroom floor! The elegant Savannah Collection features intricate carving detail at the crown and gentle scallop detail on the baseboards. The collection makes a statement, and works well for a traditional room or an ornate nursery for a little princess. Munire’s Savannah collection is available in linen or onyx finish. Come by Royal Bambino in Murrieta, CA to explore this and other floor models by Munire Furniture, as well as other fine furniture brands! A nursery glider is a piece of nursery furniture that you may not realize you need, but will certainly be one of the most useful parts of your nursery. More comfortable than a traditional rocking chair, a nursery glider moves with a smooth gliding motion designed to lull your little one to sleep. 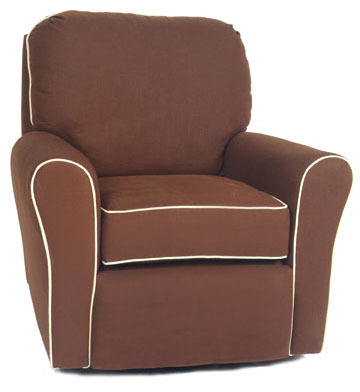 Little Castle Furniture Company specializes in upholstered swivel gliders and children’s furniture. Little Castle Nursery Gliders feature taller backs to support the head and neck during feedings, and higher arm rests to support the arm during nursing. Little Castle has over 15 different models of adult glider chairs available, ranging in size from the smallest and most popular Cottage Glider to the larger Chair and a Half and the Cottage Chaise. The Chair and a Half is a great choice if you are having twins! A gliding ottoman, stationary ottoman, or hassock is also available for every model! Consider an ottoman even with a recliner; it is attractive, and it can be more comfortable to put your feet up without having to recline the chair. Every Little Castle glider is custom made to your specifications, and you have over 120 Little Castle fabrics to choose from, such as chenille, polka dots, or easy-to-clean micro-suede! Now, also choose from 10 other options of House, Inc fabrics, or supply your own fabric for a truly custom glider chair! Consider choosing a fabric that will blend in with your home décor, and the glider can be moved into the living room or a family room after your child is done nursing! Choose a tailored skirt, a ruffled skirt, or a box pleat. Ottoman skirts can be chosen to match your glider skirt. Mix and match fabrics for the chair and the skirt, or choose a contrasting piping option. Choose arm covers, a nursing pillow, a throw pillow, or a lumbar pillow to match your new glider chair. Royal Bambino offers free fabric swatches for Little Castle gliders, so you won’t have to choose based on photos alone! We also offer consultations to help you customize your glider without confusion. These extremely comfortable Little Castle Nursery Glider Chairs may soon become your favorite seat in the house!